It’s OS X - Ultimate runs great on all but the newest Intel Macs, and under Mac OS X 10.2 through 10.6.9. Older Mac OS 8 and 9 version available on the CD, as is a PC version. More Games - 25 Games including Klondike, Pyramid, FreeCell, Spider, Casino Klondike, Forty Thieves, Montana, Baker’s Dozen and more. 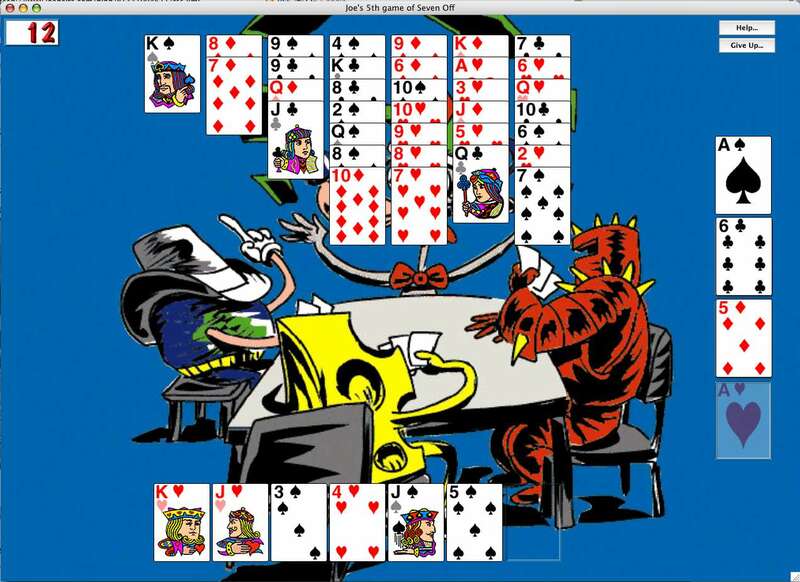 New games include Double Klondike, Seven Off, and Eleven Off. More Artwork - Lots of new fabulous artwork for Ultimate X. More Backgrounds - You can also add your own pictures. Just drag them into the Backgrounds folder. Support for bigger monitors - Now you can play in a big window made for your huge monitor — up to 1600 by 1200 pixels. More Statistics - Undo statistics, comparison statistics, and all your old favorites. Cheating! 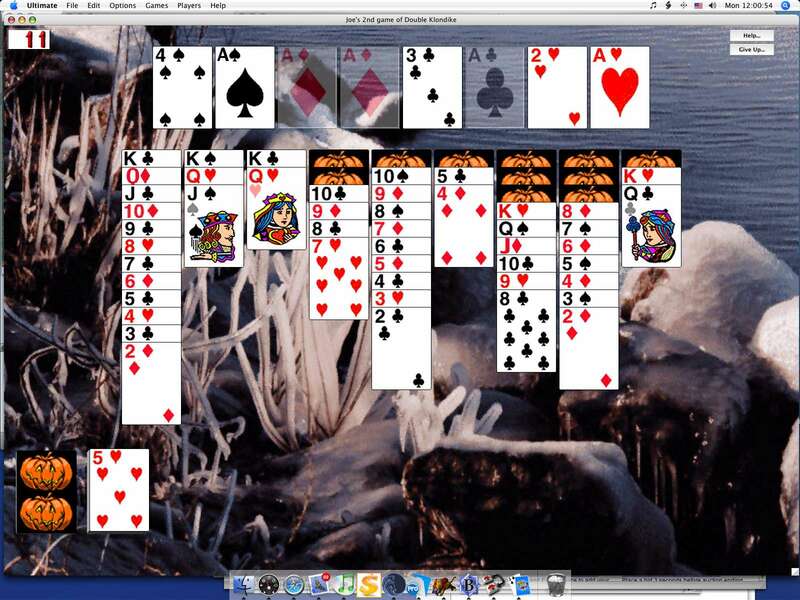 - Now you can finally win those unwinnable games. The Weasel speaks - voice actor Derek McCaw brings the Weasel to life. More Easter Eggs - Even more secret stuff to discover. 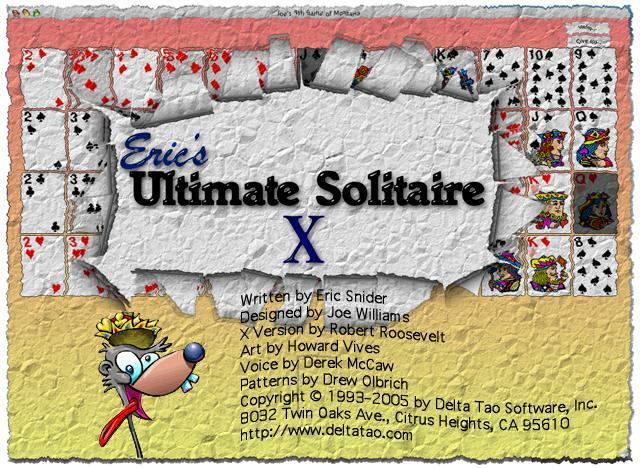 You can order Eric’s Ultimate Solitaire X for Mac OS X (10.2 – 10.6) direct from Delta Tao Software at (800) 827-9316 or (408) 730-9336. Registered Ultimate 1.0 users can upgrade for $24.95. Or Order online.